The ship's dining options cleverly cover all bases, while remaining faithful to what Princess has done well in the past: Finely balancing pleasing those passengers who prefer a traditional cruise ship dining experience (set time, tablemates, server and restaurant), while also pleasing those who enjoy the flexibility of choosing a different restaurant at a different time. 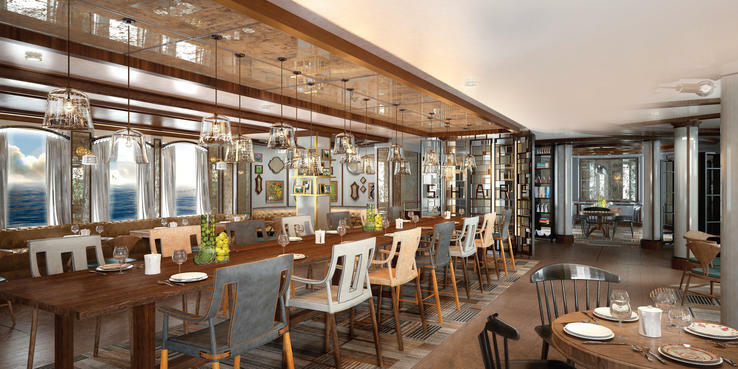 There's a strong slow food ethos in the ship's new for-fee dining options -- both of which are backed by celebrity chefs -- including SHARE by Curtis Stone and The Salty Dog Gastropub. The relaxed, yet gourmet-style dining of the new offerings complements that of the steak and seafood restaurant, Crown Grill. The ship accommodates vegetarian dietary requirements well, although those with an allergy or intolerance to gluten might find it more difficult to find suitable choices without giving the ship advanced notice. Similarly, it is advisable to let the line know of any other special dietary requirements in advance. Michelangelo Dining Room (Deck 5), Botticelli Dining Room (Deck 6) and Da Vinci Dining Room (Deck 6): Emerald Princess' three main dining rooms are all similar in style; large open rooms with neutral color tones, rich wood paneling, patterned carpets and rustic Italian paintings on the walls. Crisp white linens cover traditionally set circular tables. All three restaurants serve breakfast, lunch and dinner. Botticelli Dining Room offers fixed dining times (7:30 a.m. to 9:30 a.m. for breakfast; 12 p.m. to 1:30 p.m. for lunch; 3:30 p.m. to 4:30 p.m. for afternoon tea and 6 p.m. or 8:15 p.m. for dinner); while Michelangelo (5 p.m. to 9 p.m.) and Da Vinci (7:30 to 9:30 p.m.) Dining Rooms offer anytime dining, which means passengers aren't restricted to a reservation time. The breakfast menu is extensive, featuring dishes such as Maine blueberry pancakes, eggs Florentine, a fresh fruit plate and grilled minute steak with ranch-style eggs. Lunch includes brunch options -- such as James Beard's French toast with a cornflake coating -- for late risers, plus a range of other options from burgers and vegetarian burritos to crisp-fried calamari. Desserts -- a fresh fruit tartlet, cinnamon rice pudding and double chocolate fudge cake, as examples -- round off the menu. The dinner menu, which is the same in all restaurants though changes daily, is broken down into appetizers, "always available" dishes, soups and salads, pastas, main courses and desserts. Typical dishes lean toward traditional Italian (the executive chef is Gaetano Patamia who has been with Princess Cruises since 1976! ), including gnocchi filled with Asiago cheese in a creamy truffle sauce, roast veal or aged beef tenderloin in a whole-grain mustard crust with chasseur sauce and rich sweets such as a Normal Love chocolate dessert. The menu also features a selection of Princess Favorites that are available every evening, such as grilled salmon or chicken. Vegetarian options are creative and clearly indicated on the menu, including dishes such as the zucchini ripieni gratinati (cheese and onion stuffing with a cannellini bean ragout), a caramelized onion and potato tart, and tomato salad with sauteed mushrooms and scallion cream. Michelangelo and Da Vinci suit the flex-dining crowd who prefer to dine at different times each day. The advantage to this is you can work around your day's schedule and dine earlier -- or later -- should you feel like it. On the downside, the restaurants are naturally very busy and occasionally passengers have to wait in line for a table. International Cafe (Deck 5): Across from Vines, by the Piazza, the 24-hour International Cafe has its own bakeshop (with onsite ovens so you can smell the tantalizing cookies, desserts and croissants as they cook). For breakfast, there are croissants and pastries, and for lunch there are salads and quiches, all included in your cruise fare. The cafe does have a short menu of specialty items that are available for an extra cost -- the chocolate fondue is worth every cent and calorie. Horizon Court Buffet (Deck 15): The ship's buffet venue is open for breakfast (6 a.m. to 11:30 a.m.), lunch (11:30 a.m. to 3:30 p.m.), snacks (3:30 p.m. to 5:30 p.m.) and dinner (5:30 p.m. to 11 p.m.). Breakfast includes a range of cereals, yogurt, fruit, pastries, cold meats and cheeses, bread, made-to-order omelets and cooked items such as fried and scrambled eggs, bacon, sausage, black pudding, grilled tomatoes and beans. There's also a selection of muffins and waffles to cater to the sweet-toothed passengers. At lunchtime there's a well-stocked deli area, sandwiches and meats, soups and a whole host of sides and salads. Dinners are sometimes themes -- a Bon Voyage; Welcome Dinner (on the first formal night), Candlelight or Bavarian Beerfest -- for example. Horizon Court is extremely popular at breakfast and on sea days at lunchtime and despite the large space, one problem we found was a lack of seating. Though stewards are quick to wipe down and turnaround tables as passengers leave the restaurant, one morning we scouted out the entire restaurant to find a seat and ended up sharing a table with a fellow passenger. Cafe Caribe (Deck 15): Just behind Horizon Court Buffet on the Lido Deck is the smaller and slightly more intimate Cafe Caribe. The cafe offers terrific themed buffets for lunch on sea days, such as Mexican, Indian and Trattoria. Wines are sold only by the glass here. Cafe Caribe opens from 5 a.m. to 6 a.m. for a continental breakfast; 6 a.m. to 10 a.m. for a full breakfast and 12 p.m. to 2 p.m. for lunch. It is closed for dinner. Pizza and Ice Cream Bar (Deck 15): On the same deck, midship, you'll also find a pizzeria and ice cream bar, open daily from 11 a.m. to 11 p.m. It's an ideal quick fix for rumbling tummies and the pizza slices are delicious. Feasting on a late-night snack of pepperoni pizza while curled up to watch a film on the big outdoor screen by the pool brought us pure joy on one of the evenings at sea. Trident Grill (Deck 15): The poolside grill serves made-to-order grilled items such as hamburgers, veggie burgers, hot dogs, chicken and fries. Trident Grill is open from 11 a.m. to 11 p.m.
Room Service: Room service is free and available 24/7.Breakfast can be ordered from 6:30 a.m. to 10:30 a.m. by completing the cabin card and placing it on your cabin door by 11:00 p.m. the previous evening. The complimentary room service menu includes sandwiches, salads and pastries.Canapes and pizza can also be ordered via room service at a $3 charge. Vines Wine and Seafood Bar (Deck 5): Although technically the ship's wine bar, Vines also offers freshly prepared sushi and tapas in addition to the best selection of wines onboard. This is not your standard buffet sushi either; like in authentic sushi restaurants, the chef makes your sushi roll to order, right in front of you. The same with the tapas. Both are complimentary when you order a glass of wine. Salty Dog Gastropub (Deck 7); $12: Located inside the Wheelhouse Bar, the Salty Dog Gastropub brings the gastro pub vibe to Emerald Princess. The restaurant is a result of Princess Cruises' partnership with Argentinian chef Ernesto Uchimura. The menu (offered nightly from 6:30 p.m. to 10 p.m.) offers excellent value for money at $19 per person. It starts with a complimentary appetizer of Ernesto's Dip Sticks, including a beer-cheddar fondue; followed by a selection of small plates (passengers select three) such as Maryland-style jumbo lump crabcakes, calamari frites, wild mushroom saute, pale ale pork cheek and a to-die-for lobster mac and cheese. Don't miss the feted Ernesto burger, which includes a fresh ground rib eye and short rib patty, grilled pork belly, cave-aged Gruyere, caramelized kimchi, beer-battered jalapeno and charred-onion aioli served in a smoked salt and pepper brioche bun! The plates are small but surprisingly filling. If you have space left, desserts include strawberries and cream, bourbon chocolate pot de creme, coffee and doughnuts and a lemon posset. Salty Dog's menu also offers a selection of classic craft cocktails ($8.95), many of which feature gin and throw a modern twist on classics such as the Salty Dog Negroni and 24k Margarita. The craft beer movement is celebrated, too: There's the Seawitch IPA, Seawitch Blonde and Seawitch Denali Red (all $5.95), in addition to the regular offering of beers, cider and wines. Nothing about the venue -- the Wheelhouse Bar -- has changed and passengers who are just looking to enjoy live music over a beer, cocktail or glass of wine also frequent the space during these times. Crown Grill (Deck 7); $29 and $14.50 for children ages 3 to 12: The ship's signature steak and seafood restaurant, Crown Grill, is a real treat -- the kind of restaurant you'd visit to celebrate a romantic dinner or birthday. It balances old-style glamour with a relaxed atmosphere, with images of New York scattered over the walls and a table showcasing the different marbled cuts of beef to tempt passengers before they order. Passengers can either sit in the leather-clad booths or at circular tables. Specialties include seared scallops, Chilean sea bass, brioche-breaded king prawns, four-ounce Maine lobster tails, New Zealand double lamb chops, a Madeira-glazed Wisconsin veal chop and an array of steaks. Although the menu is based on steak and seafood, there are touches of fine dining that make for a really memorable experience, such as the salt menu; a selection of salts are served from around the world, from Hawaiian black salt to pink Himalayan salt, paired with your steak. After feasting on seafood and steak, the dessert menu's s'mores are a must. You also find cheesecake and lemon meringue, among other classics. SHARE by Curtis Stone (Deck 16); $29: SHARE by Curtis Stone, the Australian celebrity chef with a presence in Australia and the U.S., has brought the slow food movement to Emerald Princess. The restaurant has a relaxed feel and a modern look -- think industrial decor and eclectic art. There are a selection of two- and four-seat tables offering ocean views and long farmhouse-style tables in the main space. Diners may choose one selection from each course (appetizers, mains, sides, cheese and desserts). Following current restaurant trends, the restaurant features a sharing concept that encourages passengers to order a selection of dishes to share. A charcuterie platter opens the menu, which flows with a selection of appetizers, including a shrimp salad and an indulgent roasted Alaskan king crab tagliatelle. Mains include roasted turbot with a Gruyere crumb, butter-poached lobster, wild mushroom ragu, a magnificent twice-cooked duck and a fall-apart beef cheek pie. Dishes are small, allowing room for the cheese and dessert courses; there were French, Italian and Spanish cheeses, as well as a delightful Californian cheese, which were followed by desserts of ricotta fritters, a citrus tart and dark chocolate cremeux. Chef's Table; $95 with paired wines, $80 without: The 10-person chef's table (you don't have to be part of a group of 10 to enjoy the experience) makes for another memorable dining experience. Starting with Champagne and appetizers in the ship's galley during the height of dinner preparation, passengers get to see chefs and waiters in action -- a real behind-the-scenes experience; just that is worth the price of admission alone. After appetizers you're led out to a specially designated table in a private dining area and served a multicourse menu paired with wines that are selected just for the evening. Dinner is a bit theatrical -- the meats are wheeled out and carved tableside and the chef interjects between each course to talk about the dishes -- with flair. Chef's Table guests also receive a group photo and signed cookbook at the end of the meal. Ultimate Balcony Dining; $45 for breakfast and $100 for dinner, per couple: To take advantage of Ultimate Balcony Dining, you need to reside in a cabin with a balcony, of course, but what you get is a romantic meal for two, outdoors, complete with table set with white linen and festooned with flowers. The $100 per-couple charge includes a four-course meal, a small bottle of sparkling wine, a pre-dinner cocktail and a photo portrait. Breakfast is available from 7 a.m. until 11 a.m. and dinner is available from 6 p.m. to 10 p.m.; reservations are required.